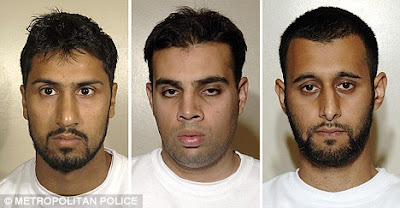 The failure of the jury to convict all eight Walthamstow terror suspects (and none on the most serious charges) - despite a £10 million trial lasting months and a slew of hyperventilating headlines - has, we are reliably informed, caused "astonishment" among members of the British Intelligence services. It has certainly astonished much of the media, who take their lead from the police and intelligence agencies and had prepared suitably hair-raising packages in expectation of a series of unambiguous guilty verdicts. And well might the viewing/reading public be astonished. Hadn't we all seen that film of a bottle exploding in a carefully-controlled experiment (at the thirty-fifth attempt, but only Channel 4 mentioned that last night)? Hadn't we heard politicians warn us about a new 9/11, thwarted in the nick of time? Hadn't we read the script? The nasty plotters who were found guilty yesterday have inflicted misery on untold millions. Passengers must spend ever longer queuing, being frisked and surrendering expensive perfumes and lotions before boarding. Airports have spent extra billions on security — which will inevitably mean higher fares. It's certainly true that draconian restrictions on hand-luggage and yet more security checks - just to make sure your grandmother isn't secretly a deadly international terrorist - were imposed in the immediate wake of the arrests, have scarcely been relaxed since, and are unlikely to be relaxed for the foreseeable future. But it's the government who ordered these largely symbolic restrictions: and they only did so after the alleged plot - which the security services had been monitoring for many months - was broken up, by which time any risk the would-be terrorists posed to airline security was no longer relevant. But then that's the nature of anti-terror politics. It's about using security to make people feel insecure. If you're standing around for hours in a queue having your baby-milk confiscated just in case it's part of a bomb, then there must be a serious danger to justify all the inconvenience, mustn't there? After all, the government would hardly be doing it for fun? So most people put up with the hassle. They may grumble, but it's all in a good cause, after all. Can't be too careful. After all, the authorities are trying to protect us. And so the seriousness of the threat is brought home to the public, not by the continual going off of bombs (which hardly ever happens), but by the myriad inconveniences which constitute most people's experience of the ongoing "war on terror". Indeed, by demonstrating stoicism while submitting to the intrusive, undignified and above all timewasting security procedures, passengers may come to believe that they are "doing their bit" to ensure the defeat of Al-Qaeda. Better still, why not follow the logic of the Sun and blame it all on the terrorists? Martin Amis did. In July 2005 I flew from Montevideo to New York - and from winter to summer - with my six-year-old daughter and her eight-year-old sister. I drank a beer as I stood in the check-in queue, a practice not frowned on at Carrasco (though it would certainly raise eyebrows at, say, the dedicated Hajj terminal in Tehran's Mehrabad); then we proceeded to Security. Now I know some six-year-old girls can look pretty suspicious; but my youngest daughter isn't like that. She is a slight little blonde with big brown eyes and a quavery voice. Nevertheless, I stood for half an hour at the counter while the official methodically and solemnly searched her carry-on rucksack - staring shrewdly at each story-tape and crayon, palpating the length of all four limbs of her fluffy duck. There ought to be a better word than boredom for the trance of inanition that weaved its way through me. I wanted to say something like, 'Even Islamists have not yet started to blow up their own families on aeroplanes. So please desist until they do. Oh yeah: and stick to people who look like they're from the Middle East.' The revelations of 10 August 2006 were 13 months away. And despite the exposure and prevention of their remarkably ambitious bloodbath of the innocent (the majority of them women and children), the (alleged) Walthamstow jihadis did not quite strive in vain. The failed to promote terror, but they won a great symbolic victory for boredom: the banning of books on the seven-hour flight from England to America. My daughters and I arrived safely in New York. In New York, at certain subway stations, the police were searching all the passengers, to thwart terrorism - thus obliging any terrorist to walk the couple of blocks to a subway station where the police weren't searching all the passengers. And I couldn't defend myself from a vision of the future; in this future, riding a city bus will be like flying El Al. In the guilty safety of Long Island I watched the TV coverage from my home town, where my other three children live, where I will soon again be living with all five. There were the Londoners, on 8 July, going to work on foot, looking stiff and watchful, and taking no pleasure in anything they saw. Eric Hobsbawm got it right in the mid-Nineties, when he said that terrorism was part of the atmospheric 'pollution' of Western cities. It is a cost-efficient programme. Bomb New York and you pollute Madrid; bomb Madrid and you pollute London; bomb London and you pollute Paris and Rome, and repollute New York. The age of terror, I suspect, will also be remembered as the age of boredom. Not the kind of boredom that afflicts the blasé and the effete, but a superboredom, rounding out and complementing the superterror of suicide-mass murder. If we make security trade-offs based on the feeling of security rather than the reality, we choose security that makes us feel more secure over security that actually makes us more secure. And that's what governments, companies, family members and everyone else provide. Of course, there are two ways to make people feel more secure. The first is to make people actually more secure and hope they notice. The second is to make people feel more secure without making them actually more secure, and hope they don't notice. The other thing that matters is agenda. There are lots of people, politicians, companies and so on who deliberately try to manipulate your feeling of security for their own gain. They try to cause fear. They invent threats. They take minor threats and make them major. And when they talk about rare risks with only a few incidents to base an assessment on — terrorism is the big example here — they are more likely to succeed. During this first year of Heresy Corner, terrorism has been a recurring theme. But the stories have been about the reaction to terrorism - the culture wars, the cack-handed attempts by politicians to "reach out" to potential Islamists, battles over civil liberties - most notably the so-far unsuccessful campaign to defeat government plans to introduce 42 days pre-charge detention, the amateur terrorists failing to detonate their explosives, Jihadist sympathisers such as the "lyrical terrorist" Samina Malik, the constant escalation of language by politicians and police chiefs. Not much actual terrorism, though. Certainly not in this country, or the US, or anywhere outside the hot-spots of Iraq and Afghanistan and a few other troubled regions. Has anyone in Britain actually been killed by "terrorism"? Possibly. I don't have the figures, but I'm willing to bet one or two travellers have suffered fatal heart-attacks while waiting to be checked in. A brilliant piece, thanks Heresiarch.